One of the most dangerous airports in the world, Tenzing-Hilary Airport, also known as Lukla airport, hugs a small plateau in the Himalayan foothills. It is the gateway for trekkers into the Sagarmatha national park and climbers trying to reach the summit of Mt. Everest. The runway has a length of 460 m and a 12 degree slope – it needs aircraft with STOL (short takeoff and landing) capacities to operate from it. Usually DHC-6 Twin Otter or Dornier Do 228 aircraft, weather permitting, connect Kathmandu and Lukla. Today we will make the trip with the Beechcraft 1900D, a more modern commercial twin-engine turboprop which is also up to the task ahead. Preflight preparations begin at Kathmandu airport. We will take off before dawn and experience the sunrise in-flight over the mountains. The route is about 70 miles due east from Kathmandu, just along the main mountain range. In good weather, several major summits are visible. 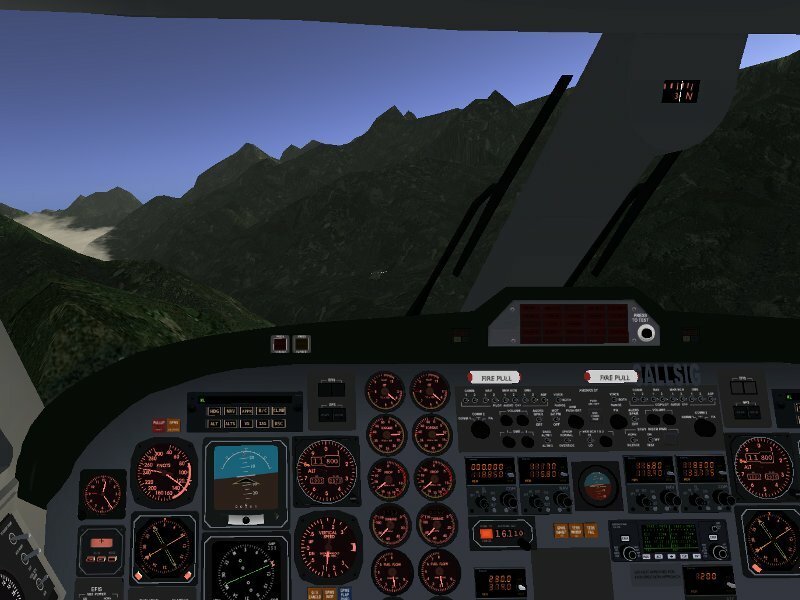 Lukla itself is not equipped for instrument approaches, so we have to approach in VFR flight. Many airports in Flightgear have a set of night textures, making the models visually appealing not only during day but also when it’s dark. Similarly, for many airplanes the cockpit lighting is modelled in some detail. Here, I have switched on the main panel light to illuminate my cockpit during flight preparations. The aircraft models also usually have strobe, nav, taxi or landing lights simulated. Today, we have broken cloud cover over Kathmandu. As we climb, dawn approaches and the sky brightens, outlining the towering mountain ranges. Kathmandu has an elevation of 4300 ft, Lukla of about 9300 ft, but even this altitude is not even halfway up to Mount Everest with a bit above 29.000 ft. In fact, since the B-1900D is only certified up to 25.000 ft, we wouldn’t even reach the summit at top altitude. 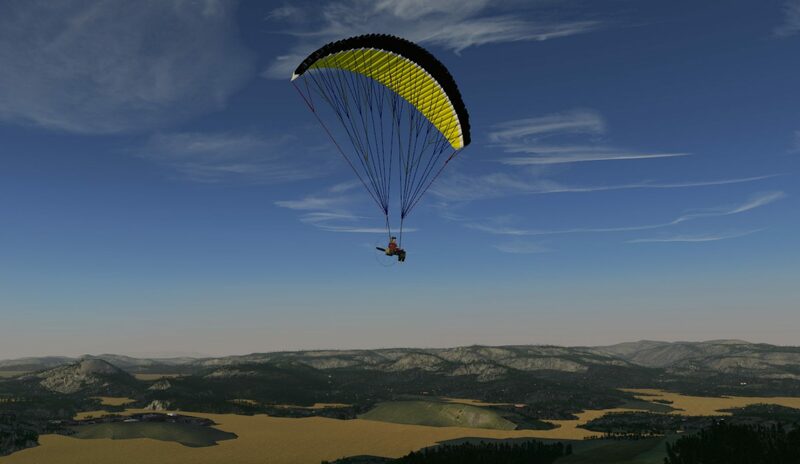 At sunrise and sunset, Flightgear models the different level of light available on the ground and in the air. While it may still be dark on the ground, more light reaches the plane at higher altitude. A few minutes later, the sun comes above the horizon and sky and cloud lights up while the terrain is still in deep shadow. For this flight, I am using a development version of Flightgear which experiments with an improved modelling of atmospheric haze layers and shading of the terrain during sunrise and sunset. The result are quite impressive views of the sky. Presumably, this feature will become available with the regular release of Flightgear 2.6. As we reach Lukla valley, the sun is up and some morning fog hangs in the lower foothills of the mountain ranges. 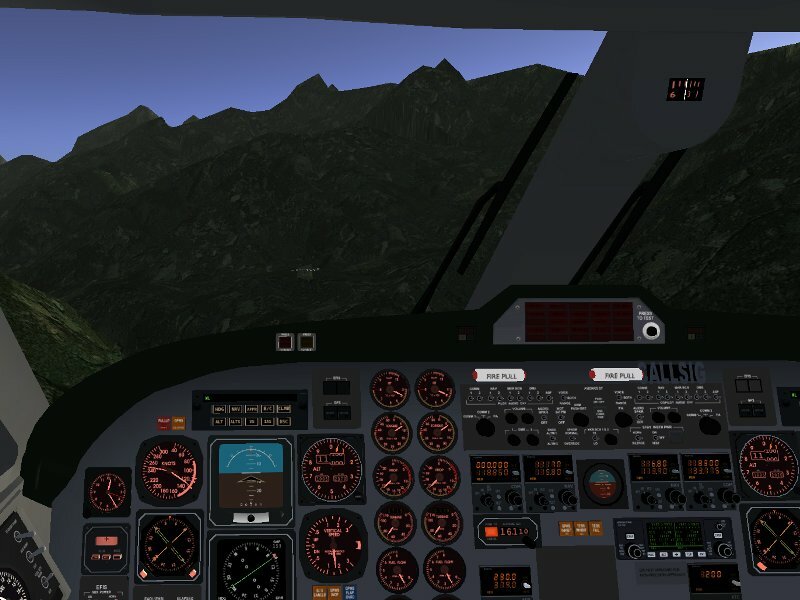 Now we turn into the approach, and Lukla valley is right before us. There is some fog in the upper valley, but the airstrip itself is clear (it can barely be seen just below the left windshield wiper). We fly close to the left valley edge to have more space for the final approach. This means crossing some ridges at low altitude and sets off terrain warnings. Many planes in the Flightgear world have instrumentation which warns about insufficient terrain clearance or potential collisions with incoming traffic. Now it’s time to turn right into the 060 final approach. The wind is bad – it comes almost right from the rear, but as you’ll see shortly, the approach to runway 30 isn’t exactly available. Here we are, lined up with the runway. Time to get the gear out and to decelerate a bit. Some wind drift as we come in – last minute corrections. Lukla is not an airport for missed approaches or second chances – there is a solid rock wall right behind the runway and no chance to pull up. We have to hit the runway now, no matter what happens. 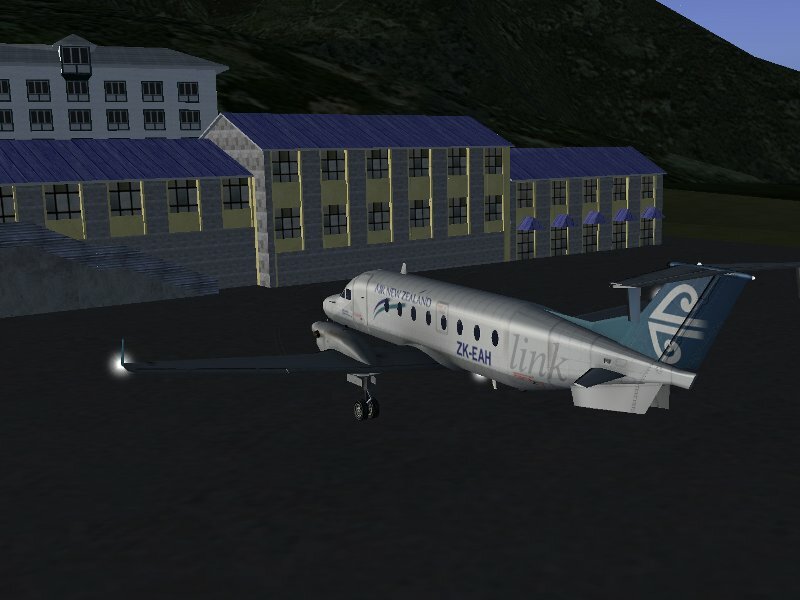 This fairly detailed model of Lukla is an addon to the official Flightgear scenery. And… here we are, braking real hard. Welcome to Tenzing-Hillary airport. We hope you enjoyed the flight with us! 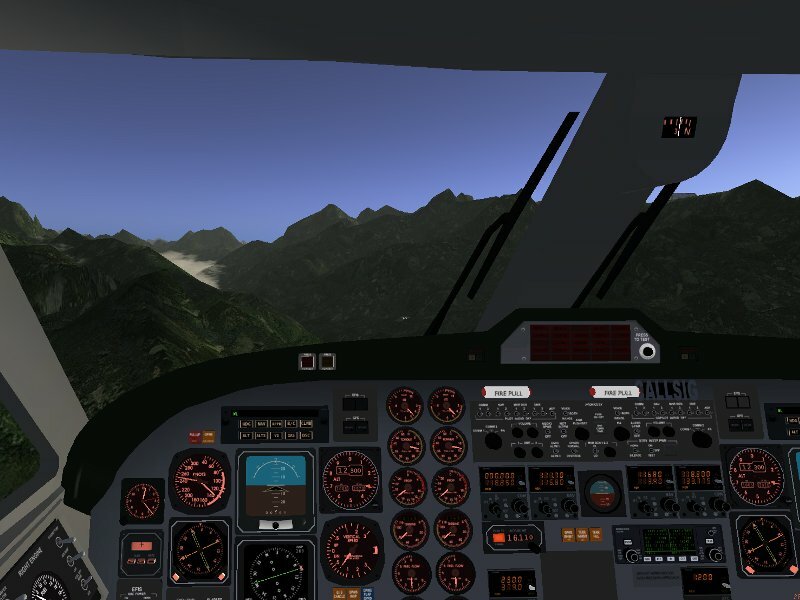 In case you find the idea that Air New Zealand would operate in the Himalaya a bit odd, Flightgear offers The Livery Database where many more liveries from all over the world can be found for popular aircraft.